Donny was in London 2004, he was making an appearance at HMV Oxford St. singing & signing autographs. Going back to evening before, I had planned for all of the family to visit London as a day out as the kids on ‘Inset Day’ (school closed for day) & it wasn’t until after the plans did I know that Donny was to be at HMV, to this day my kids still do not believe me & say I planned the trip well ! I promise this was not the case, but no regrets as I met Donny ! We arrived in London early, walked into HMV & no one about, where were the fans ? I asked someone & told they were queued around the building tucked away and they were just coming in & I should join the Section A queue which was coming in now, WOW that was lucky ! My girls joined me but Andy & James watched from afar & the big screen ! 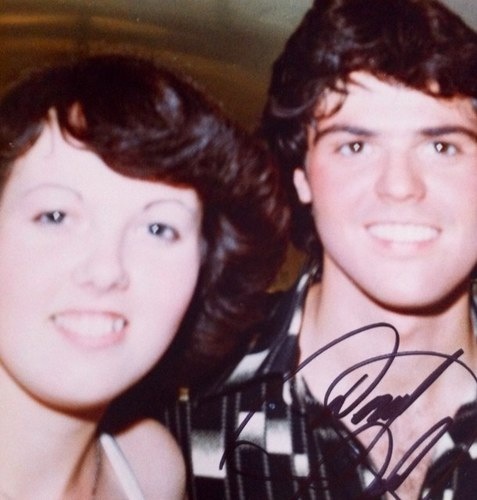 Donny performed, amazing as always, then it was time to go on the stage and meet him, Abbie had my photo with Donny from 1977 Tour with her to get signed for me, ‘is that your mom’ he asked & I had DVD ‘Live from Edinburgh Castle’ signed.